The space propulsion company Accion Systems has announced that they will officially start taking orders for their micro-propulsion systems designed for CubeSats and other small satellites. The company is selling miniature electrospray ion engines that generates thrust by accelerating charged particles to very high speeds. Accion’s engine, about the size of a small coin, uses 480 microscopic nozzles that make use of capillary action that direct propellant out of the engine. Capillary action enables liquid to flow into narrow spaces without the assistance of an external force like gravity. If you put a straw in a glass of water, some of that water will travel up the straw because of capillary motion. Founded in 2013, Accion has completed a $2 million seed round and received a $3 million Department of Defense contract. While they’ve already sold 3 of their units to government and research partners, this will be the first time they are making their miniature ion engine available to commercial partners. Developed at MIT, the ion engine has undergone years of development and testing. Last August, Accion performed their first technology demonstration in space. Dr. Natalya Brikner, co-founder and CEO of Accion, told TechCrunch that this on-orbit flight test matched performance qualities they’ve achieved in the lab. What’s unique about micro-thruster technology is that it offers a capability to small satellites owners that they’ve never truly had before: propulsion. Propulsion is important for all satellites because it enables them to correct their position within their orbits around the Earth. In space, there are small perturbing forces that can slow a satellite down or change its position within its orbit. For small satellites, traces of the Earth’s atmosphere are strong enough to cause it to deorbit and burn up in the atmosphere within months. If these satellites had propulsion, they could extend their lifetime from months to years in orbit. More time in orbit means that satellite owners can get more bang for their buck. Traditionally, limitations on space and mass have forced small satellite developers to forego propulsion systems in their design. 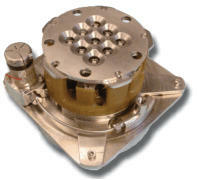 Companies like Accion and Busek have worked to solve that problem by miniaturizing electric ion propulsion technology. Electric ion propulsion is different than the type of propulsion you see during a rocket launch (known as chemical propulsion). Electric ion propulsion doesn’t provide a burst of power, but rather a small amount of thrust by throwing charged particles out of the engine at very high speeds. Spacecraft whose missions require long journeys into the solar system have made use of ion propulsion. While it doesn’t provide much thrust at a given time, each individual “push” propels a spacecraft a little bit faster through the vacuum of space. Without much drag to slow the spacecraft down, ion propulsion can eventually get a satellite moving at very high speeds. NASA’s Dawn spacecraft, for example, used ion propulsion and achieved the record of highest velocity change of any spacecraft. As of 2015, Dawn has achieved a velocity change of 38,300 kilometers per hour (23,800 miles per hour) since its launch in 2007. More recently, ion propulsion has been proposed for small satellites. Ion propulsion doesn’t require explosive chemical reactions, which is attractive to small satellites owners who typically “piggyback” onto launches and are discouraged from include toxic, volatile propellants in their design. The problem is that historically, electric ion engines have been too large for small satellites. Part of the reason for this is because traditional ion engines make use of relatively large pumps to move propellant around. To miniaturize the electric propulsion design, Accion and Busek did away with these pumps. Both companies have created small propulsion solutions for small satellites, but with distinctly different designs. Busek has nearly 30 years of experience over Accion and recently sold its first micro electric ion engines to NASA for use on small satellites. As a start-up, Accion is working to compete with companies like Busek with technology improvements to enable ion thrusters to work longer and eventually, be more powerful. Brikner told TechCrunch that their engine leverages an innovation that she worked on for her PhD at MIT. The now-patented technology allows Accion’s ion engine design to have a longer lifetime than Busek’s equivalent electrospray product. Comparing their competing products, Busek and Accion have achieved around the same level of thrust, but Accion is working to change that. Most recently, Accion completed a proof of concept lab test demonstrating that by including 4 times the number of microscopic nozzles on each engine they could greatly increase the amount of thrust provided. With the recent test, Accion’s engine achieved the same amount of thrust as traditional electric ion engines, but with 1/30th the mass and 1/30th the volume. This test has yet to be demonstrated in outer space, but could be a game changer for ion engine technology. Accion is now taking orders on their current product which is scheduled to be flight-certified by October and ready for a mid-2017 delivery.